James D. Watts: Arts: Philbrook Downtown unveils ‘Game On!’, www.tulsaword.com, 04 May 2017. 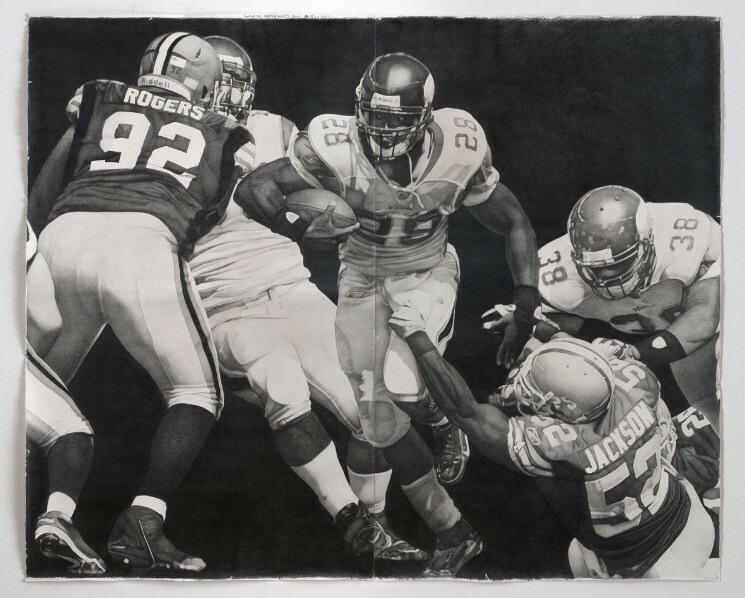 If so, Philbrook Downtown is opening Friday a new exhibit built around its most recent acquisition: an gigantic graphite drawing of Minnesota Viking running back and former Oklahoma Sooner Adrian Peterson breaking through the Cleveland Browns’ defensive line during the first game of the 2009 NFL season. The work by Los Angeles artist Karl Haendel, titled “Wishbone,” was purchased by Philbrook in December when Philbrook officials visited Art Basel, the international art show held in Miami, Fla.
“The minute Sienna (Brown, the museum’s curator of contemporary art) and I saw it, we knew this was our pick,” said Scott Stulen, Philbrook executive director. “The fact that it’s a image of Adrian Peterson, who has ties to Oklahoma, is a plus, but the image is so strong it could have been of any player, and we still would want to add it to the collection.